I can’t believe I’m writing ANOTHER post on sleep training. But, every time I hear someone talk about how *great* sleep training is, or Ferberizing, or cry it out, or whatever, I just can’t help it. One day, my dream is that people will sit around, scratching their heads, wondering why on earth anyone would ever leave a young baby in another room alone to cry. Sleep training is the loud bossy salesman or a diet pill. It sounds so enticing, everyone’s doing it and the promises are so exciting (sleep?! )… But please, people, grow a backbone and politely say ‘no‘. Don’t sell you or your child short! There’s always a catch to a short term solution, we should know this! There are countless studies against sleep training! COUNTLESS! The list of detriments to a child who has been ‘trained to sleep‘ range from increased risk of later developing attention deficit hyperactivity disorders (ADHD), to decreased emotional, intellectual and social development. Lowered IQ is also on the board. I’m not saying that this will always happen, but it certainly could. A young infant seperated from his or her mother, has been shown to experience difficulty regulating temperature, heart rate and breathing. It is also well known that when infants are left alone to cry, they produce large amounts of cortisol (the stress hormone)… Since when did stress help anyone, especially to help a baby, to develop and thrive? Children develop 95% of the brain neurons (or pathways) in the first three years of life. Life long skills like trust, love, understanding, and empathy are set as foundations for all future learning… A study of Romanian orphans actually measured the amount of ‘gray matter‘ in a child’s head and found that neglecting young children reduces the actual size of their brain?! Ok, I know that example is a bit extreme, but still… not responding to a baby’s cry is certainly a form of ignoring (remember babies can’t speak and tell you what’s wrong) and does not help a child’s brain to grow, end of story. Why take the chance that you could hinder the development of your child’s brain just to get a few extra hours of sleep? I know, I know lots of people like to get their undies in a bunch when they read this sort of stuff. “But, MYYYY kid cried it out and he/she is fine!” Or, “But, MYYYY parents let me cry it out and I’m turned out great!” Well, maybe we are all ‘ok‘… But, have we ever thought that maybe we could have turned out better? I’m a high school teacher and when I see some of the bizarre ways that some kids act at school, I often wonder if these were some of the kids who were left to cry it out… I’d love to do a survey one day. But, forget the freaking studies! What about experience? I ACCEPT MY KIDS CRYING. I’m a firm believer that all children benefit from a good cry, as a form of stress release. But, I would never ever let them cry alone. What would it teach them to be locked in a room alone? To sleep?! Or, would it teach them that I care about them *sometimes*, like when they’re awake. But, that I don’t care about them other times, when they ‘need‘ to sleep? What sort of mixed up message would that be sending them?! Falling and staying asleep is not a skill. It doesn’t need to be learned. 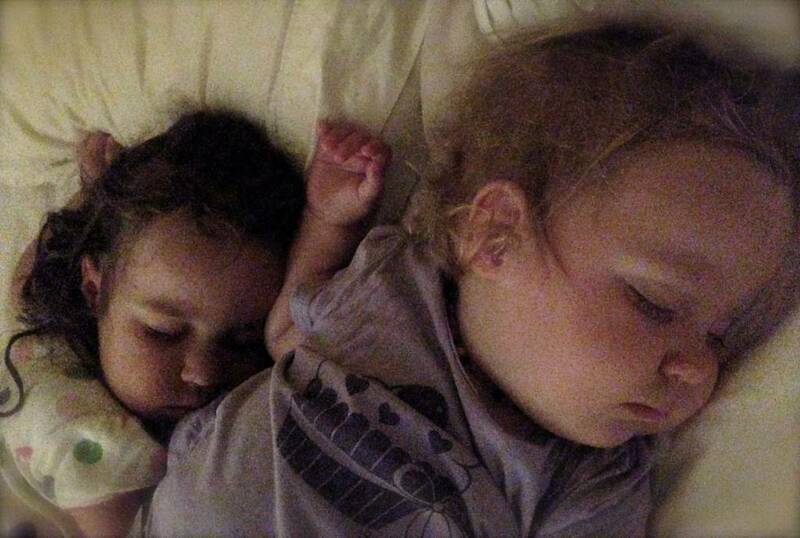 My girls have never cried it out, and I can assure you, they know how to sleep. Sure, they woke up at night a few times every night when they were little, but that is absolutely normal! My kids are still relatively little, but guess what, they sleep! All kids will eventually sleep at night! I feel so lucky that I never listened to anyone who told me that I should get them to sleep 12 hours at night by the time they were six months old. I CAN’T SLEEP 12 HOURS STRAIGHT… CAN YOU?! Kids learn quite well how to sleep, without being locked in a dark scary room alone to cry. The ‘eight hour of sleep‘ thing only become standard in the past hundred years or so, when surprise surprise, the ‘eight hour workday‘ was introduced! What if we ditched the idea that babies need to be ‘trained‘? What if we believed that babies are intelligent, responsive and able to learn from their environment. Every parent needs to re-think the ideas that have been spoonfed to us from well meaning friends, family and main stream media sources. Everyone wants to get more sleep, sure, we’re a sleep obsessed culture. But, sleep training doesn’t necessarily do anybody more good in the long run, the studies all prove that. I would never let my babies cry it out, because I want my kids to be the best that they can be. Whatever they do, wherever they go, I want to know that I did everything that I could in the first few years of their lives to nourish and support their developing brains and little bodies. I want to sleep easy when I’m older, knowing that I did everything I could to support my children when they were tiny. Here here ……! I’ve been looking for confirmation that what I am doing with my boy is the right thing. Thank you. All parents should read this. A child needs to know that crying isn’t a bad thing. It’s magic to get a big hug when I cry. I love being held when I’m sad. Love your blog…I feel the same way. Although my the most my 19 month old will maybe sleep is 4hours straight and then wake up to nurse and nurse and then nurse some more. I wish she would sleep longer so I could get a better nights sleep. I also disagree with letting your baby cry it out would be the best approach. Yeah, I get up 3 to 5 times a night to attend to my daughter, but that’s my job as a mother. I want her, no I need her, to know that I will be there for her if she needs me. It breaks my heart to hear her cry and if there’s anything I can do to make her more comfortable, you better believe I will! People try to tell me that babies need to learn how to self soothe and letting them scream alone in their room is the solution. I’m sorry, but that makes me sick. I don’t mean to be so over dramatic, but this topic always upset me. There’s nothing more important than knowing that my daughter can trust me. I like how you said that babies need to cry cause it’s a release of stress. I also hold her and dance around the room when she needs to cry. It’s rewarding later when she’s smiling at me again. Thanks for sharing this. I don’t think you’re being over dramatic! I also feel sick when I think about babies crying in a room alone! Even by reading your post, I felt depressed. Even in my dream if I may hear my baby crying for me, I will get frantic to hold her immediately. Being raised in India, I can’t imagine people leaving kids to cry to sleep. But only recently there are “modern” people around me suggesting to put baby on bed and let her “sleep in her own even if it involves some crying”. My answer has been “why letting baby cry to sleep is an option? If u think crying is not bad, let her cry in public place. Why go all huggy kissy in a public place to soothe the same child u r ok with crying at home?” in my opinion, “crying to sleep is not bad for child” is made fashionable by mean and selfish beings. They only want to love them as cars. Buying accessories, showing off, washing and cleaning gives them happiness. But when they are done with it, they want it to keep shut and stay parked in the driveway and not trouble them. There is a reason God gives us kids, so that we love them and loving means selflessness, sleepless nights and tons of patience. If you have ever seen a pottery wheel, you wud realize how much love, patience and focus goes in making each and every pot every time. You can’t put clay on wheel and switch on motor to get a pot made. Beautiful analogy to the pottery 🙂 I think it is important to make sure that we don’t turn into mother martyrs either… we can let a baby cry, it’s actually good for them to release stress. Just not alone as a means to get more sleep! agreed, mothers are not martyrs. We have to understand the difference between “crying to release pain” and “crying in pain”. The baby in my arms, cries, for food, or for my attention, to complain, or to release stress. But away from a loving parent the child IS “crying in pain”. gawd this is a huge one and i’ve found conflicting opinions amongst my own friends…i agree with your view, and i haven’t experienced it all yet so i find it hard to ‘debate’ or discuss anyway, with anyone who so confidently says that it’s such a short time they cry for and then no worries… maybe there are some people too, who haven’t got it totally together emotionally/mentally themselves, are super tired or stressed and find that leaving a crying baby for a bit is all they can do, to allow time to cope with their own crazy mind…?! there is so much we don’t know about people. It’s true, Chaquita, sometimes parents need a break because they are stressed and feeling violent or angry towards their children. In that case, even I would advise to put the baby down and walk away for a few minutes. But, in general, cry it out should never be acceptable as the norm to get a baby to learn how to sleep… We certainly need our village back to help out when mamas are feeling stressed and overwhelmed. I needed to read that crying for emotional release is “okay” as long as they are not alone. My son will cry for me (we nurse to sleep and bed share) when I’m not there but my husband is there comforting him and they bed share too when I’m gone. I always felt guilty that he cries when I’m at work so this made it a bit better. Thank you! Love your blog. So glad you found this and it was useful! Yes, the crying is ok, so long as they’re in a loving person’s presence. If you want to read more about it… it’s called Cry in Arms, there’s an entire book about, ‘Tears and Tantrums’ by Aletha Solter, very fascinating stuff! Amen! My kids NEVER cried it out they are intelligent loving sweet children and we get complimented everywhere we go. “Training children is a BIG POINT of contention between my hubby’s family and us but guess who has better behaved kids? I don’t know what miserable sleepless nights you’re talking about… my nights are full of cuddles and love and warmth and security (and sleep, yes, we all sleep quite well thank you).